(1) Rates of conflicts with domestic pets and livestock should increase with time as wolves push outward from “core” habitat and occupy less suitable habitat (i.e. places where conflicts should be more common). (2) Rates of human-caused mortality should increase as more wolves come into conflict with people and are subsequently killed in response. With these expectations in mind, I download the most recent data from the FWS and set about running some very basic analyses. Specifically, I plotted a regression line through 16 years of data on confirmed per capita wolf depredations, as well as the percentage of the wolf population killed/controlled annually. In layman’s terms, I sought to determine if per capita conflicts (depredations) and per capita removals (controls) were increasing with time (specifically the 16 years since reintroduction). As expected, figure 1 shows an increase in total confirmed depredations (pink line) that largely mirrors the growth in the wolf population (blue line). However, per capita depredations, though highly variable, have remained essentially stable. Specifically, the regression line indicates depredations increased by 0.005 per wolf, per year. 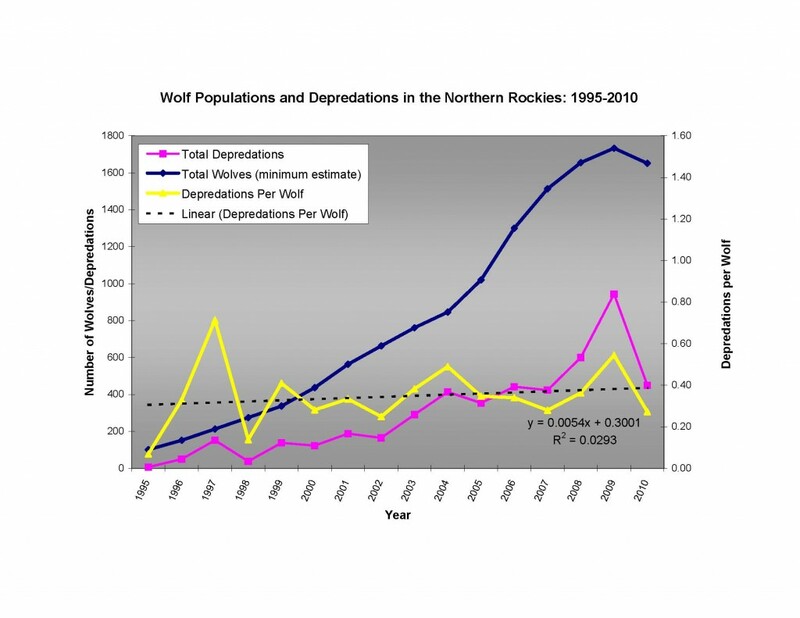 There were an average of .33 depredations per wolf in the first five years (1995-1999), and 0.36 depredations per wolf over the last five years (2006-2010). In layman’s terms, depredations per wolf have not increased substantially with time as one would expect if wolves were occupying less suitable habitat. I used a similar approach to determine if wolves were being killed more frequently in response to conflicts. First, I calculated the percentage of total wolves that were legally killed in response to depredation events (i.e. controls / total wolves) each year (1995 – 2010), then I plotted a regression line through these data points. This time (figure 2) you can see a clear increase in per capita control, which averages 4.6% over the first five years (1995-1999) and 14.1% over the last five years (2006-2010). The lack of increase in per capita depredations corresponding with a significant increase in per capita control indicates that more wolves were being “controlled” per depredation in recent years. How many? On average, 0.12 wolves were killed for every depredation in years 1995-1999, while an average of 0.41 wolves were killed per depredation in 2006-2010 (2010 was the highest year, 0.58). What does all of this mean? I suspect that depends upon who answers the question. For me, the lack of increase in depredations per wolf over the recovery period suggests the habitat occupied by wolves throughout the entire recovery period (1995-2010) was “suitable”, and there may be more suitable habitat than the FWS originally thought. However, the increase in per capita control suggests that the FWS was being aggressive in their attempts to “maintain the peace” (i.e., keep conflicts to a minimum). If wolves were more aggressively controlled in “unsuitable” habitat as time passed, this could explain why depredations per wolf failed to increase; that is, one might interpret these data as suggesting that the FWS’s increasingly aggressive control helped prevent an increase in per capita depredations. Yet, it is impossible to know what would have happened were another course of action pursued. Great statistical anaylsis Ralph. I am thankful for your thought & effort in putting this together. I am interested to see how the hunting season will impact depredations and control. Perhaps, as more pack structures are fragmented by the death of individual wolves, we will see an increase in depredations. Loss of Alpha Wolves and Adults who help hunt could cause younger wolves to go after easier meals. We may also see an increase in dispersers who will seek less hostile territoty in unoccupied country. But- will we see less wolf control now that some emotions can be released through the hunting season? Just a note. The article and statistical analysis is by Dr. Jeremy Bruskotter. I am very pleased to see these data finally analyzed. The data from the last wolf hunt don’t necessarily support this conclusion; that is, conflicts went down following the hunt. However, that particular year conflicts were quite numerous and so were targeted lethal removals. Also, depredations dropped more in Wyoming (with no hunt) than in Montana and Idaho, so I think the jury is still out. This is another area where spatially explicit information could provide for a more informed analysis (see WM’s comments below). Statistics or not, I believe that wolf control will be much more aggressive after delisting. The states want wolf populations reduced and depredation control actions are one of the best ways to achieve that on a year round basis. I predict that the states will allow liberal take of wolves by Wildlife Services including entire wolf packs and pups in response to depredation incidents where the USFWS would have never responded that way in the past. The hunting and trapping seasons will have limited success in reducing wolf numbers so wolf control is the next logical step. My biggest concern continues to focus on documentation backed up with photographs, detailed reports and transparency. If a wolf pack is proven to be chronic, then control is justified – recognizing that non-lethal measures should always be implemented when practical. I agree that wolf control is likely to get a whole lot more aggressive under state management, and I share your concerns regarding transparency. I also think hunting and trapping by themselves are likely to be insufficient to reduce wolves; however, I suspect we may see an increase in SSS as folks will no longer have to worry about federal prosecution. My point in assembling these data was more to reflect on what constitutes “suitable” wolf habitat, as I think some important assumptions were made about habitat suitability that still deserve some discussion. As I stated on the other thread, which apparently gave rise to this one, the important next level of the analysis is to eliminate those areas where wolves have migrated, but where there are NO domestic livestock (maybe either individual packs or entire state defined wolf management units). A depredation analysis should focus only on target rich environments for the killing of domestic animals. I do not know what that does to your data sets, and the resulting statistical analysis, but surely the number of depredations per wolf will increase (substantially? ), because these kills are events of opportunity. Otherwise, the statistics in my view kind of skew the resulting conclusion, to under-represent the damages caused by wolves in specific reas. In other words, if there are no dogs/equines/sheep or cattle within a particuar area occupied by specific wolves, then they sure as heck won’t be killing them, and therefore should not be included in the data sets. The second point, is maybe to include the OR and WA data. OR, which will also likely increase per capita depredation. The third point is a need for an acknowedgement that only “confirmed” kills are included in the tables, and hence your data. “Probable” wolf kills, are not included in the tables. And for practical reasons neither are depredation attacks by wolves that do not result in death to the depredation target, but may still require the owner to absorb vet bills. Regarding your first point…I think it would indeed be relevant to spatially analyze these data in the way Treves and colleagues have done for Wisconsin. However, I take exception with your idea that this analysis should necessarily “skew” in favor of underrepresenting wolf damages. Wolves were specifically reintroduced into areas without livestock in order to keep conflicts to a minimum. As they pushed out from these areas, they have occupied places where conflicts are more likely (i.e., livestock are present). Thus, it stands to reason that conflicts, if anything, should have increased with time as more and more wolves come into contact with livestock. Moreover, as wolves press out from the National Parks and wilderness where they were introduced, they should more frequently be in areas where dead livestock are easier to find, and confirm. The fact that per capita depredations have not increased despite wolves’ presence in these areas suggests perhaps they are more “suitable” than we (scientists, collectively) thought. Second point: I included all confirmed depredations from the NRMs, but I don’t have 2011 data. Third point: These are good points for discussion of the broader implications of wolf depredations for local tolerance. However, I’m not sure how meaningful they are for determinations of habitat suitability. Again, as wolves push out from more rugged wilderness areas into human-dominated settings, livestock depredations should be easier to find and confirm. Wolf management is just a diversion from attention to the Cosmic Thumb. It is hard for me to remain very optimistic about the progression of future natural resource management, as human encroachment continues to infiltrate the landscape. Even well- meaning people wishing to live closer to nature, whom move into the WUI (wildlife urban Interface) zone, displace that which they seek, by elimination of critical winter ranges, and/or creation of more “unsuitable” wildlife habitat. I often wonder if exploitation is deeply embedded in the dna of the dominionist culture, as history reveals how nation building came at the expense of human (indigenous) and wildlife resources as Manifest Destiny marched westward. There were always those who opposed the methods used while traveling that path, even back then, as there continues to be now. While great strides have been made to bring back most of the wild things that were nearly wiped out (though some tribes, passenger pigeons, etc were exhausted), how likely is it that we will change the calculus of our modern exploitative consumptionism? Acknowledging that math of the cosmos works exponentially (human populations, debt) and considering the impact of mans invention of usury, does not lead to a very optimistic view of our future bottomline. Even with whistleblowers, from Niemeyer to Adebayo (EPA insider who took them to court over vanadium mining and human rights violations), whom bring nefarious situations to light, and are an inspiration for potential change, will it ever be enough to undermine what is in our own dna? Our nation still holds and acts upon a dominionist worldview, often in the absence of factoring in natural capital to the industrial capitalism equation. We continue to subsidize big business (especially oil, mineral, agriculture) with favoritism across the landscape. Debt climbs, economies advance the trend of hyper- inflation. Compound interest creates an unstable system on a planet with finite resources. Only debt, not wealth, can grow exponentially forever. Even computers, ( modern day poster-child of consumption) that seem to dominate the dominators, more and more, are made with metals from the exploitative march. We never seem to learn enough from history to significantly change the over-all equation from exploitative to sustainable, even though all our agencies and institutions claim that is how we manage. So incrementally, with the instrument of collaboration and compromise, (and the wrong equation) we push the “trade-offs” line backwards toward the debt-wall. The turning of grass from green to brown, works slowly, so is often not seen, until after the conversion, but it happens all the same. Rather we see it or not, our consumptive nature is like an addiction. And we all know how high the rate of recidivism is for any kind of addiction. So in the end, the ultimate dominator, Nature, will win. It would just be nice if we humans could figure out better ways to be kinder to ourselves. We need a social system shift that is more accountable with living on a finite planet. Promoting that image of “the shiny city on the hill, may just be a domionist mirage, built a-top a faulty foundation. New architecture is sorely needed. Sorry Dr. Jeremy~ Great Report. Of course we have to presume that only ” sanctioned” control actions are being taken. Those who engage in some derivation of SSS would not show up in the data. Q: Are some number of local wolves being ” controled” by local [yahoos] , cowboy patriots, mountain militiamen? Probably, but I would guess not many. Q: Do we even know how many wolves are really out there since radio collars and researchers/agents are in finite supply ? Probably not. My own opinion —and it is just that — is that wolf ” management” will be very aggressive in Wyoming : public and private; legal and illegal; is trending that way already on all fronts. I’m just not sure we can quantify it coming and going. Not that I disagree with Ralph’s trend lines. Wolves are already overcontrolled here around Cody. I am in agreement with Mountain Mama. Just not used to seeing some deep thinking involved with wolf management since most decisions would much closer resemble “knee jerk”. 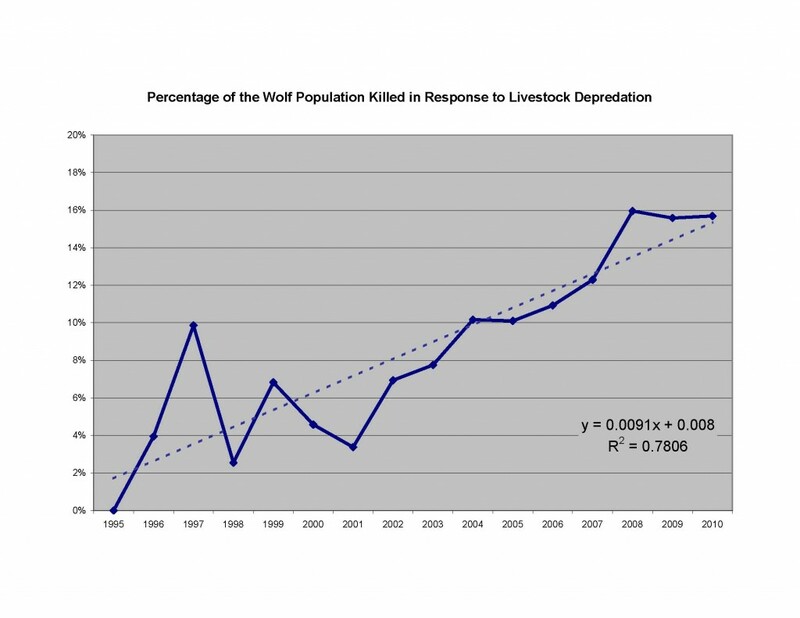 Few decision makers use the statistics of wolf recovery and dispersal to reach their political conclusions on what should be done when wolves kill livestock. What hasn’t been discussed is the amazingly low number of livestock that have been killed by wolves considered that they are a recovered population. There are so many other causes that are greater in numbers compared to cattle that are killed by wolves. to partly answer your question. Yes, you would leave all packs in statewide even if they don’t live in livestock areas. But if all suitable habitat is supposedly gone I don’t know where many of those suitable areas would be. However, it would be too tricky statistically to randomly remove those areas. However, many of us have argued that wolf control (including hunting seasons) should be designed more in areas of conflict and less in natural areas where they don’t kill livestock. Since I am not privy to all of the livestock incidents that happen, I can’t explain the various scenarios you describe BUT, livestock depredations do not have to be that complicated to investigate OR report. If wolves have clearly run four horses and caused death and injury, and the livestock owner reported the incident, then those livestock should be included in the data base for the annual report. What you suggest is correct because only the confirmed livestock seems to make it into the Northern Rocky Mountain gray wolf annual reports. In Idaho, the other categories of livestock – probable and possible/unknowns are not shown but that data base does exist and can be obtained from IDFG or the Nez Perce Tribe’s websites. The other source would be directly from Wildlife Service’s annual report. I’m not sure how Montana and Wyoming report their probable and possible/unknowns. Each category is broken down further into confirmed killed, confirmed injured, confirmed missing and so forth. That is the best I can tell you. As wolves disperse out of YNP and central Idaho into a broader interface with people and livestock the conflicts will grow proportionally. HOWEVER, professional agency investigations should always be the driving force behind wolf management. I probably sound like a broken record but wolf management should not be knee jerk, based on anecdotal stories, whether it pertains to ungulates, pets or livestock. Fundamentally, professional investigations lead to solid statistics that identify problem areas and situations where wolf management agencies can focus on wolf reduction. The government has tried to keep up the war on coyotes for decades by pouring good money after bad and have never and will never achieve control of the coyote population in the lower 48 and will go bankrupt trying. Back to basics – the agencies should focus on the real problems and let hunters and trappers take up the slack.